let's get back to the story of the Bank's evolution. First we have Sampson's bank, then Taylor extends to the east so the Transfer business can move out of the Entrance block. Taylors second intervention projects the Court Suite out to the West and adds a library at the back. Finally he adds the L shaped extension that embraces garden Court. Where this meets up with the Court Suite Taylor intended to erect a barracks block, but he died before this could be built. Soane took over the job, embellishing the Facade with symbolic stacks of cannon balls. He also closed off the site with a simple boundary wall along Princes Street, creating a roughly triangular backyard. This was not destined to stay empty for long. He proceeded to fill it up with an irregular patchwork of rooms, including a new governors office. Most of these rooms would be altered beyond recognition as part of Soane’s NW Extension, but the Governors room remained. In Sampson's bank, the court suite was directly behind the pay hall, on two levels, overlooking the Bullion yard. The Committee room was on the ground floor in the corner of the yard. Taylor moved it to the far end of the new wing, beyond the Court Room which had been on the first floor of the old block. The governor stayed behind for a couple of decades until Soane was able to slot him into the back yard. Even then his connection to the two meeting rooms was a bit circuitous. Another two decades would pass before Soane could reorganise the Directors Parlours. But that's another story. We elaborated the interior of the governor's office and the Court Suite quite a while ago, but the rooms where they used to be, behid the Pay Hall, remained empty shells. There isn't much information on which to base a fitout, just a fairly crude pencil-drawn section. Also, the function of these spaces later on in Soane's time is not very clear. It also seems that they were sub-divided in fairly pragmatic ways for clerical work of some kind. Rather than second-guess this banal reality, it seemed better to simply preserve a memory of the original spaces that Sampson created. The zone behind the new court suite had a very complex evolutionary history and it's easy to get confused. A diagram based on translucent overlays is helping me to understand how Soane's earlier work, crammed into the triangular yard, relates to his later expansion to the North-West. You can see that the triangular open space that he used for toilets earlier, actually forms the basis for the Waiting Room Court, (a much grander function, to be sure) To create the L-shaped "Long Passage" he cut through a small open yard between Sampson's rear block and Taylor's Library, then turned left and sliced portions off the two offices he had built into the triangular yard at the beginning of his career. I guess you could call that a palimpsest: layers of history overlaid upon each other. It's probably quite confusing to the casual observer, but this diagram really helps me to put those spatial and temporal relationships into some kind of logical framework. Let's finish with a couple of Enscape renders. The old Court Room by Sampson was smaller and less elaborate than Taylor's later creation, but it's also a long rectangular space, lit from one side. The paneling on the walls may actually have been timber, and we are missing a dado rail and skirting, but it's starting to look like an actual room, with a bit of character. Enscape is the right tool to give us an impression of the pleasant garden that the Bank acquired when it took over the churchyard. In the early days of the Bank, when they rented the Grocer's Hall, the director's parlours had overlooked a garden, so Taylor's new location was restoring a relationship with a prior history. I like this view, through the window at the west end of the Pay Hall. Of course most days in Eighteenth century London wouldn't have been so clear and sunny as this, but I'm claiming a bit of artistic license. One thing I love about going to a conference is the opportunity to explore a new city. 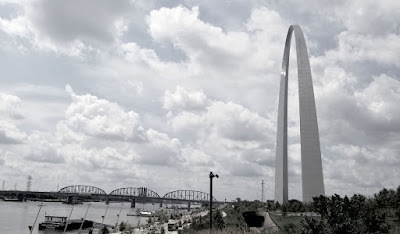 St Louis is called the Gateway City, not because of its giant catenary arch on the banks of the Mississippi, but because it used to be where you started from, back in the day when people said things like "go west young man." It was a good place to buy everything you needed to stock up your wagon train, and by 1900 it boasted the busiest railway station in the world with 42 platforms lined up under a single roof span. Union Station is now a conference venue and host to this year's BiLT North America, where the future of BIM and digital construction was hotly debated. I had just one day to tour the city, so after a quick stroll around the base of Eero Saarinen's famous arch, I headed inland to check out Wainwright Building. Designed by Chicago architect, Louis Sullivan in 1890, this was a seminal building in the development of the modern skyscraper. I was struck by the contrast between the bold, rhythmic verticals of the facade and the wild, intricate detailing of the terracotta spandrel panels. It seems to be a conversation between traditional craft skills and technological innovation. Wainwright building stands at a turning point in the history of our industry. Loadbearing masonry and staircases had set limits to the height of buildings for centuries. Structural steel plus Otis elevators suddenly made a ten storey building seem perfectly reasonable. Sullivan chipped in, as architects do, by showing how this new potential could be given a coherent expression. Today, the innovations are digital. Cloud services are everywhere, and the whole world is a database. Will A.I. and robotics finally bring construction into line with the efficiency levels that other industries have achieved? BiLT is a "by users, for users" conference. The speakers are mostly hardened BIM addicts like myself. We get together and talk about "BIM-wash", unrealistic claims that inflate the expectation of clients. We hammer our heads against the thorny problem of data standards in a complex and diverse industry. We used to think that BIM was all about a "single source of truth", a virtual building that coordinates the entire team, from concept design through to building maintenance. That idea is still valid, but the focus is shifting. We are starting to accept the fact that different roles require different tools. What matters most is being able to connect the data. Imagine a technician maintaining passenger elevators. They might use a smartphone app to guide them through diagnostic routines and record actions taken. The elevator company can farm this data and use it to analyse patterns, predict needs. It could feed into software for stock control, staff training, product development. Meanwhile, building owners have virtual models of the facilities they operate across the world. Architects and engineers have models of projects they designed and processes by which decisions were made. How do we make useful connections between these different data structures and software packages? There are busy little algorithms that seem to know what adverts to send us on Facebook or LinkedIn, based on our activity on apparently unrelated platforms and services. Imagine a web of connections between designers, manufacturers, installers and operators. What might your digital assistant announce if it was plugged into this network? “Good morning, I have compiled 17 floor plans that illustrate different approaches to the problem you are currently working on. Would you like to see them?” Or perhaps it would ask, “Did you know that Louis Sullivan designed a building in 1890 that shows remarkable similarities to your current sketch?” Microsoft Word has been making intelligent suggestions to me as I type this article, so why wouldn’t my design software do the same? It may come sooner than we think. It’s always important to have some fun in the evenings during a three-day conference. 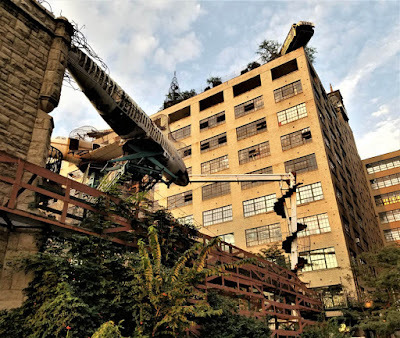 Our visit to the City Museum in St Louis fitted that bill admirably. Look it up. I would describe it as a cross between an art exhibit and an adventure playground. Sculptor Bob Cassilly took a derelict shoe warehouse and populated it with salvaged architectural and industrial objects. These are combined into structures that you can climb through, slide down, clamber over, or just admire. In the middle of all this I found an exhibit of terracotta by Sullivan & Elmslie. What are we to make of architectural ornament in the modern era? Will 3D printing technology bring swirling leaves and Celtic strapwork back to prominence on building facades? The seminal essay “Ornament and Crime” by Adolf Loos laid out the case for simplicity as a background to modern life in 1910. Artists like Picasso and Matisse broke away from realism around the same time. For the most part Architects remain highly critical of “Historical Pastiche”. Ornamental detail made sense when it was closely tied to craft skills, when it was a collaboration between architect and artisan. But in a world of where algorithms and robots construct our cities, where will we find that elusive freshness and vitality. The closing keynote brought Sabin Howard to the stage, a figurative sculptor in the classical tradition. His process begins with hand-drawn studies from life and physical manipulation of wet clay. Then it proceeds more mechanically by way of digital scaling and industrial casting. Finally, there is a return to manual techniques to impart the final surface textures. There is an important analogy here. As construction becomes more mechanized and design more computational, where will we find that human touch? It would be possible to laser-scan the terracotta panels of the Wainwright Building and 3d print them at a variety of scales. But is that what we want to do with our digital superpowers? I left St Louis deeply impressed by the spirit of a time when architects and craftsmen worked closely together under the direct inspiration of natural forms. 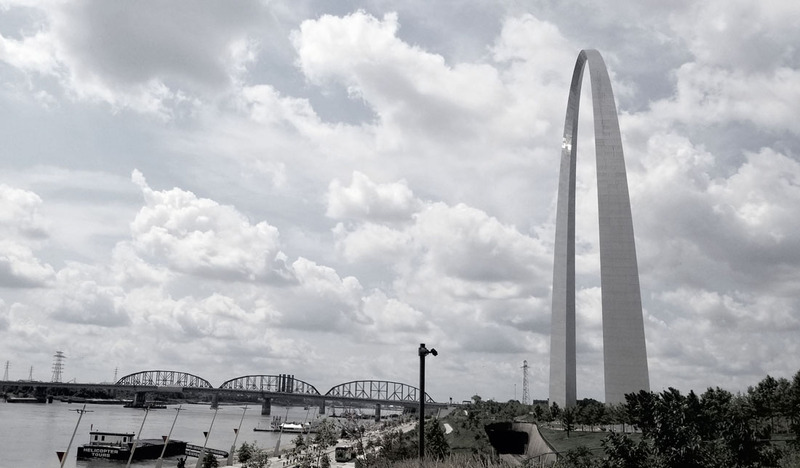 But I was also thinking about the birth of the skyscraper and the bold simplicity of a huge catenary arch overlooking the Mississippi. At the back of my mind was a simple question. How will we maintain the human touch in a digital world? Entrance Court, Entrance Building, what needs doing, what don't I understand. The external Facade is Soane's work, quite different from the original treatment by Sampson. The internal elevation, facing into the courtyard is essentially Sampson, but Taylor must have glazed the side bays at ground floor level. His East Wing allowed the Transfer Offices to move out from the upper floors, which were then converted to residential apartments. Behind the new ground floor glazing there kitchens and parlours at one side, a porter's lodge at the other. I added rustication to the ground floor of this inner Facade, giving equal weight to horizontals and verticals. These are loadable, wall-hosted families. Just a stick-on veneer. Maybe we will rethink that later, but for now it's a quick fix. Externally, Soane chose to disguise the vertical joints. I've created new wall types with a series of horizontal reveals. The joints are diverted where they pass over the three entrance arches, creating a keystone effect. More loadable families. I had done the side arches long back but the central one needed to be reworked. Finally there are groin vaults over the three tunnels. I'm using a parametric family that I made for the cellars. How much does a Grecian Urn? More to the point, how many different Urn families do you need in your classical repertoire? Soane used a couple of variations of similar proportions. Sampson's are much shorter and fatter, with garlands linking the handles. An interesting modelling challenge. So that's it for the entrance block just now, looking pretty good, maybe I should add some chimney pots. But it's more urgent to bring the rest of the model up to a similar level. I will need to extend the cellars under the entrance but that's in the main model, and there is much to do down there: groin vaults galore. There are few things to do in the Entrance Court. Doorways are incomplete. Railings and steps are needed for the peripheral light wells. Behind the Pay Hall the old court room and director's parlours need to be fitted out internally. There is at least one drawing to inform this work. But we are definitely making progress. Today I got around to restoring my Enscape3d installation. Many thanks to Jonathan for renewing my license. So I have compiled a little collage of images that show the entrance court in the context of an evolving model. In the previous post I finished with a shot showing an older version of the Bank main model. I used this because its what I happened to have on my hard drive. The current model is in the cloud. But it was interesting, because it reminds me of how little I understood several areas at the time. The reduced annuities office was part of Taylor West Wing, an L shaped block enclosing the garden Court. Late on in his career, Soane extended this upwards. I call the room Reduced Annuities Upper, but Im not sure what it was used for, or even how it was accessed. I guess you had to cross over the passage that separated it from the old barracks block. That seems to be where the nearest staircase is. There are quite a few reference drawings, including some amazing work in progress sketches by Soane's students. Insight into building site operations. Image is copyright of the Soane Museum. The way Soane picks out the three middle bays using a lunette window motif is quite impressive. It's a simple scheme that blends into the existing setting and enhances the composition. At the same time he builds in his own distinctive style. It doesn't look out of place, but he has not tried to mimic Taylor's style. The simplification of classical elements down to their basic geometry is typical Soane. As you come into the Garden Court from Sampson's Entrance Court you see a colonnade on three sides topped by a continuous stone balustrade. The plane of the wall with Taylor's modified palladian windows is set back slightly behind this screen, At the far end, facing you, Soane has extended the three bays upwards to form a cube and echoed the three arches, but in his own language. Access to the rooms of Taylor's West Wing is via corner doors. I take the oval shield & garlands motif above them to be Taylor's invention, represented at "low res" currently. I need to create a new version of Taylor's palladian windows where the void cut only penetrates half-way through the wall. This will replace the arched recess in the current model. Why did he choose a "fake window" here, rather than a niche? It could have had the columns and inner arch, but without the timber and glass. Would this have been more "honest?" Also on my to-do-list: develop the lower room. With it's paired Tuscan columns and arches supporting the walls above.